I am now starting to built a version 2 solenoid breakout board. While the first one works I have learnt a bit more about controlling the valves. Here is the diagram from Fritzing. Added resistors in line with the diodes. The flyback diode may cause the the solenoid to release too slowly. Adding the resistor speeds up the current decay and causes the solenoid to release/close more quickly. 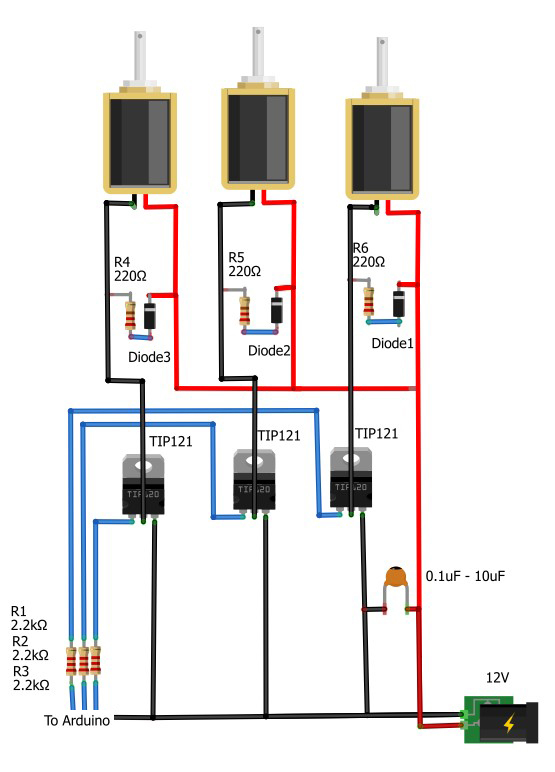 Using 12V 250mA solenoids with TIP121s, the resistor should not exceed 220 ohms. Added a small bypass capacitor connected between the TIP121 emitters and the solenoid +ve terminals. 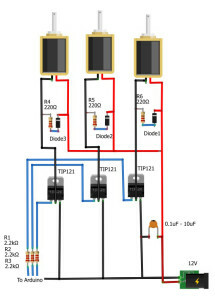 The capacitor can be connected across the power in lines which is connected to the TIP121 emitters and the solenoid +V. This entry was posted in Arduino, Water Drops and tagged Solenoid valves by Martyn. Bookmark the permalink. Your work on this has helped me tremendously with setting up a solenoid for the first time. hi i need help i have 24 vdc valve how do i connect with my breakout board , i want to use for my atc spindle tool changer . I am not familiar with spindle tool changers and I suggest you ask people on the CNC forums.